Good morning. We are now just one week from Christmas, and there are still some key uncertainties in terms of both temperature and precipitation. We’ll break it down below, but the bottom line is that the last week of 2017 does look quite cold. 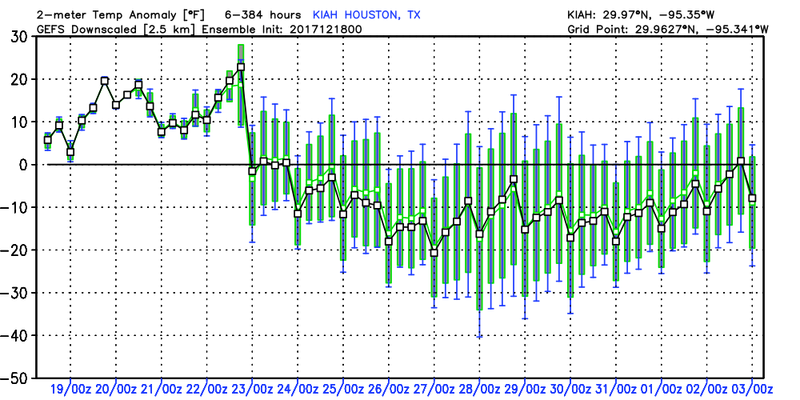 For the first time since Dec. 4, overnight lows didn’t cool down much on Sunday night for most of the city of Houston except northern areas, and lows this morning are generally only down around 60 degrees. Under cloudy skies, don’t expect too much of a warm up with highs in the upper 60s or around 70 degrees. Most of the area should also see at least some light precipitation today, with accumulations of a few tenths of an inch. We don’t anticipate heavy rainfall expect possibly for areas far to the northwest of Houston. The region’s warm and muggy weather will continue on Tuesday, with a warm night again only down in the low 60s. We’ll also see a decent chance of rainfall during the day and evening hours, especially for inland areas. If you live on the inland side of Highway 59/Interstate 69, accumulations of 0.5 inch or greater are possible, but if you live closer to the coast you can probably expect less than that. 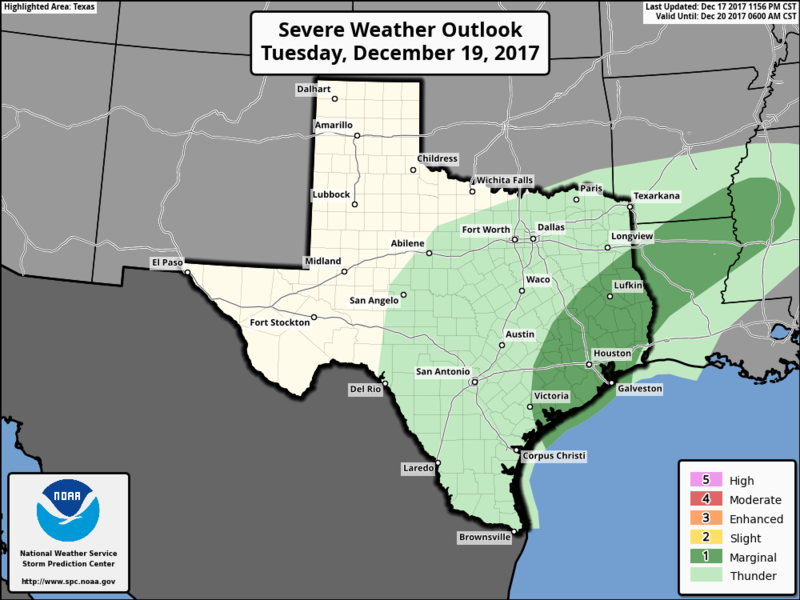 A few strong thunderstorms may be possible area-wide later in the day (see the severe weather outlook), most likely during the afternoon or evening hours. Our weather clears out, with sunny skies on Wednesday, and some clouds returning Thursday. Both days will see low to non-existent rain chances. Expect highs in the 70s for both days, and muggier conditions by Thursday night. Winter? This will not feel like it even though Thursday marks the winter solstice. But fear not—winter will return soon. Of this, we can be sure; a cold front will move into Houston on Friday at some point. There will be a decent chance of rain with the front, but right now I don’t expect accumulations to go over a few tenths of an inch of rain. This will cool things off on Friday night and bring us a significantly cooler Saturday with highs in the upper 50s to 60 degrees. But Sunday is a total grab bag. The GFS model just keeps bringing in colder air, while the European model brings a warm front back onshore Sunday, leading to warmer, muggier weather on Christmas Eve, and possibly into Christmas morning. We can expect a slight chance of rain on both Saturday and Sunday. The GFS model is cold for Christmas with highs in the 40s, and the European model brings a cold front on Christmas Eve—about the time Santa is making his rounds—so cold weather is likely on Christmas Day area wide. The bigger question is precipitation, as the GFS is pretty dry, while the European model brings cold rain for Monday and Tuesday. (Cold rain, but not snow or sleet). We’re still a week out, so this kind of model certainty is understandable. I’ve seen some forecasts for snow on Christmas in Houston, and right now that just seems totally unrealistic. Thank you and Happy Holidays to you and your families. I’ve been following you since Harvey and so has my family in California. 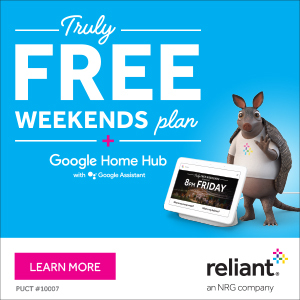 Any insights on how this system will play out in Dallas? A lot of us are going to be heading up from Manvel on Friday for the 5A D1 State Championship game. Keep the “positive waves” going for snow on Sunday night and Monday morning! We still need a little rain, falling GRADUALLY! This sure beats the heck out of last year’s Xmas day where it was too hot/humid for my son to even jump on his last year new trampoline!